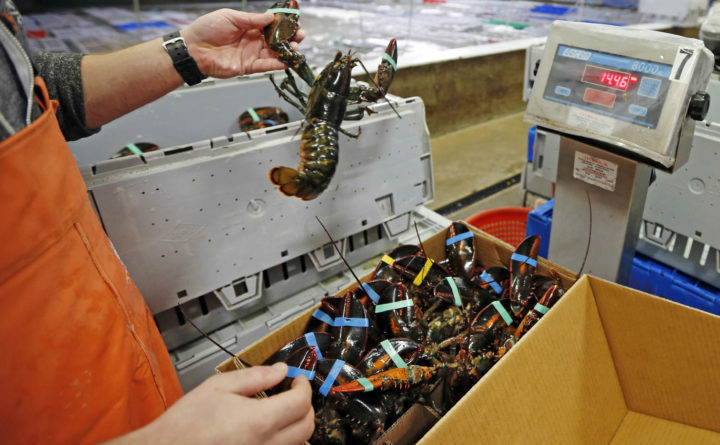 In this Thursday, Dec. 10, 2015, file photo, live lobsters are packed and weighed for shipment. A wholesale lobster company in Saco has sued a former partner in U.S. District Court in Portland alleging he embezzled nearly $1.5 million from the business by creating a fictitious customer and shipping firm. Sea Salt LLC earlier this month sued Matthew R. Bellerose and his wife, Amanda F. Bellerose, both of Scarborough; Vincent J. Mastropasqua of Portland, and his brother, Anthony J. Mastropasqua of Scarborough; East End Transport, LLC of Scarborough; and UPS. The 32-page complaint claims that Matthew Bellerose, who worked as the floor manager at Sea Salt and oversaw the shipping of lobsters, and Vincent Mastropasqua created a fake customer named Mastro’s and created East End Transport in November 2017 to perpetrate the fraud. Over the next 18 months, Matthew Bellerose allegedly had lobster shipped from Sea Salt but had payments go into the East End Transport account. He also allegedly used the address of East End as the return address label on the lobster shipments from Sea Salt. The relatives named in the lawsuit allegedly knew about the scheme and benefited financially from it. The company is seeking to recoup the losses it claims the defendants are responsible for along with attorney’s fees and costs. Shawn McEwen and Morey Highbarger founded Sea Salt in 2009, according to a profile in Maine Biz. Matthew Bellerose became owner of 20 percent of the business in 2015, the complaint said. In addition to McEwen and Highbarger, Michael McKellar is listed as an owner on the firm’s website. No one is facing criminal charges in the alleged theft of money. Sea Salt’s attorney, Laura White of Kennebunk, claims the theft violates the Racketeer Influenced and Corrupt Organizations Act, also known as the RICO statute. The case originally was filed Oct. 3 in York County Superior Court but moved two days later to federal court at defendant Vincent Mastropasqua’s request. His attorney, Tyler J. Smith of Portland, denied the allegations in the complaint. Matthew Bellerose’s attorney, Thomas Marjerison of Portland, declined to comment on the lawsuit on behalf of his client. In affidavits filed in federal court, Amanda Bellerose has denied being involved in her husband’s alleged theft. No attorney has entered an appearance for Anthony Mastropasqua. The allegations against UPS staff at the Scarborough location, which handled Sea Salt’s lobster shipments, are that employees should have been suspicious of unusually large shipments and the fake return address labels. “The allegations against UPS are frivolous and the company will vigorously defend itself,” the company said Monday.